three faceted ones were lit electronically with an LED controlled by my lighthouse beacon hardware and the round one was lit with a tea light candle. The smallest one about 5″ tall and the largest is 18″. The mid size stands at 10″ tall. Building a light house starts with a roll of copper flashing from the home improvement store, some hand tools, some reference photos, some calculating, and a bit of determination. I initially though the facets would be easier to construct than trying to smoothly roll two cone shapes and have them fit together nicely. Turns out calculating and rolling the cones was much easier than getting all of the pieces lined up just right and held together for soldering. 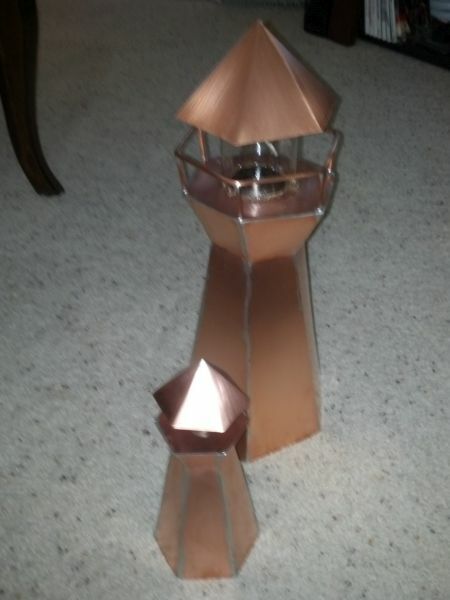 I wasn’t quite sure of the shapes and dimensions involved so all of the light houses were built in card board before working in copper. This allowed me to play with the shapes and angles before getting committed to the more expensive and harder to work material. Once the shapes were figured out, it was a matter of cutting six identical pieces, a top platform, and a roof with tin snips. 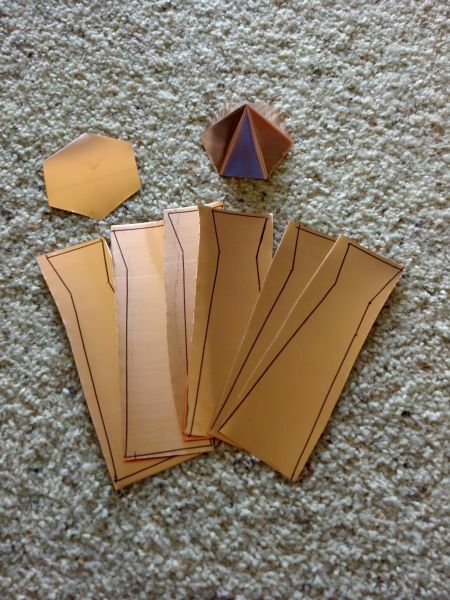 The pieces needed to be fairly accurate and fit together well or there would be gaps in the seams on the final project. Of all stages of assembly, bending the hexagonal pyramid to form the roof portion was the most difficult. There isn’t much room to work inside one the bend is started so it just takes a bit of time and some careful plier and hammer work. Because the round model was lit with a candle, the top piece had to have a grid of vent holes drilled to allow heat and smoke to escape. I found it best to drill the holes after bending the piece to shape and soldering it together. Doing it the other way would mangle the point a bit since there was not much support left. The body itself is bent roughly to shape to check fit. High spots in the seams are trimmed to get a tight joint. Once everything is fitting well, the pieces are taped together to make soldering easier. Some care must be taken to keep the flame and heat off the tape or it will burn. I generally solder a spot at the bottom of each seam to get everything started then work around adjusting the shape. Once the shape is nearly right, I do a small section on each joint at the top, right before it flares out for the top platform. I keep the top flared section until last as it requires the most adjustment to get it fitting well. 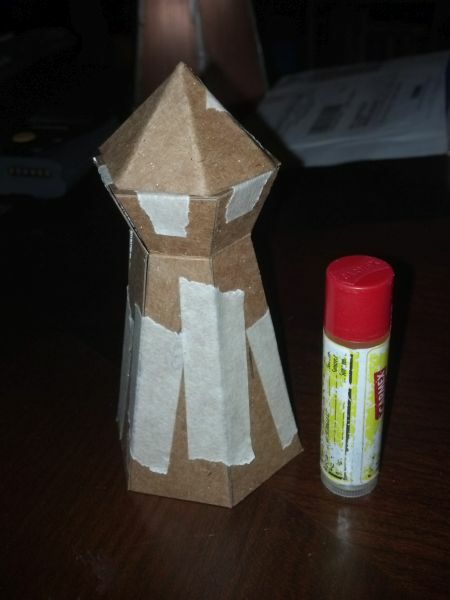 I don’t have pictures of construction of the round lighthouse, but it is similar to the faceted ones. It is made of three rolled pieces and one flat: the body cone, the transition cone, and the lid cone. The top platform is marked after the body is assembled by turning it upside down and tracing around onto the copper sheet. This ensures the platform is a good fit to the body. Once the top platform is soldered in place, the only soldering left to do is for the railing. The railing and posts are made from standard electrical wire. The middle and large size use 12 gauge wire. Each upright is soldered into place then the rail is bent roughly to shape. I adjust it as I work around it soldering to each post. The lighthouses are finished with a thorough wash to remove all of the flux from soldering as well as the residue from the masking tape. I scrubbed them using top to bottom strokes with a fine scotchbrite pad to give the surfaces a uniform brushed look. The lense varies based on what is at hand. I have used plastic tubes and various jars. For my first one, I cut the bottom off the jar and glued it down. This didn’t work very well so now I glue the lid to the top platform, screw the jar in (upside down now), then set the top of the light house in place. Once I know how the top and jar need to be aligned, I tack them together with a few drops of hot glue and firmly attach with E-6000 or epoxy. The beacon was designed to use a pulse width modulation (PWM) signal to vary the brightness of the LED. This allowed for an even and gradual fade up, flash, then fade down in order to simulate a light spinning inside the light house. The hardware was the same for each: a 1″ square ProtoBoard from SparkFun with various components. The work is done by the PICAXE microcontroller. A switch is available to determine continuous or flash mode and the flash mode is disabled if the ambient light is too bright. 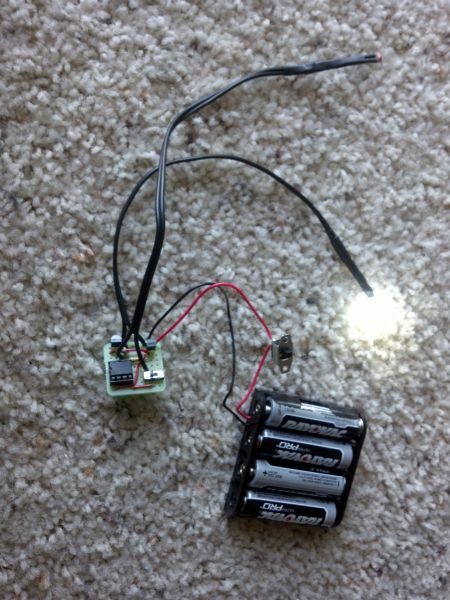 This controller was the same in all three sizes – the battery pack varied to fit within the body. The largest had a 4 AA pack, the middle had a 3 AAA pack, and the smallest could only hold a single AAA cell. These controllers will soon be available through Tindie. My kitchen utensil drawer is overflowing with tools – to the point not everything fits. My thought was putting a canister on the counter with the bulkier and longer tools would free up some space and allow other stuff to go in the drawer. Sounds easy enough. 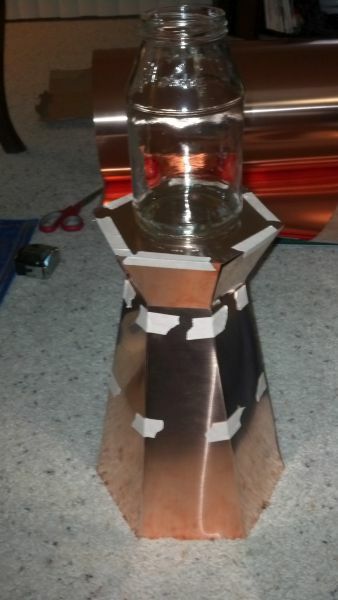 Build a copper canister and load it up. I started with a roll of copper flashing like I always do for copper projects. This guide will show you how to make your very own copper rose. This version is smaller than the ones I made a while back and the ones that I sell on my Etsy store . I will soon have these smaller ones listed as well at a price of $35 instead of the full size $60.